In July we held our annual Seaside Walk Week event with the launch walk taking place in Scarborough and the finale at Mother Ivey’s Bay in North Cornwall. Midweek we held the Thames Treasure Trails aimed at corporates working and living in London. We had 11 teams of four signed up which made for a brilliant atmosphere. 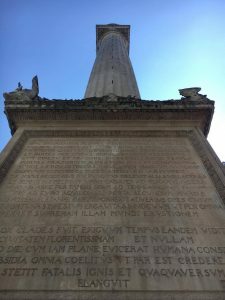 The teams all started at the Monument where guides from the British Guild of Tourist Guides were on hand to brief teams and set them off on the trail. The quiz led teams along the Thames as they followed clues and answered questions about C S Lewis’ The Walrus and the Carpenter, the Great Fire of London and the River Thames’ Final Frost Fair among others! To see the full trail, click here. Everyone successfully found their way to the finish line at a central London pub for a celebratory drink and prize-giving. All teams truly got into the competitive spirit and it was brilliant to see teams from Elman Wall and Representation Plus taking part. Next year’s Seaside Walk Week will be taking place from Saturday 21 July – Sunday 29 July 2018. So the Thames Treasure Trail dates for your diary are Wednesday 25 and Thursday 26 July.